You are here: Home » Dear RIM! It’s not me it’s you! Dear RIM! It’s not me it’s you! I got my first Blackberry in 2004. I just loved it. Email on my phone. It was every techs dream. Ok so I wasn’t exactly the first to get it but the novelty was huge at the time. The device itself was wonderful. Easy to use, robust, reliable and with a phenomenal battery life. From then until about early 2010 I continued to be a RIM supporter. When the iPhone came out I scoffed at those Apple people with their gimmicks they called phones. True I did try an earlier iPhone and loved the interface and briefly flirted with abandoning my Blackberry but the iPhones unreliability with constant freezing and poor battery meant after a month I threw it back at O2 and got a new Blackberry. I loved the Blackberries reliability. However this new latest model I was given had lost some of it’s allure as the newer screens and faster connections sapped more battery. The price one pays. That companion on travel that would always be there was no more. I found myself charging it almost every day(yes I used it a lot but still). Also after being with the iPhone for a while I found the Blackberry clunky and dated and I missed some of the apps. When the iPhone 4 came out I tried it again and I still have it. I won’t be handing it back. The Blackberry is long gone. I still work with Blackberries and shake my head every time I take one up. Don’t get me wrong aside from the Storm models they still deliver and are a very reliable device but have changed very little especially the user interface since my first model years ago. How could something that was so great fall behind so quickly. Why weren’t they listening? I have been reading plenty from tech folk on improvements they needed to make over the years. Changes that were needed. Surely management were reading the same pieces, questioning validity, listening to staff and also keeping an eye on the opposition? For the last couple of years I have been reading from some that RIM will eventually fail or at best become a small bit player for die hard fans. Initially I thought it was a little premature and they would quickly catchup but soon fell in line as new models failed to deliver as promised and in many cases such as the Storm followed by Storm 2 were horrible devices and should never have been allowed to market. The latest Playbook mess where the only real feature they can push in their advertising is Flash is beyond a joke. And watching an interview where someone defended it’s lack of email unless you already have a Blackberry was just embarrassing. What year is this again? What is one of our key forms of communication? I do however like that they at least responded to the anonymous letter but unfortunately they didn’t really address any of the issues. And nothing I have read lately leads me to believe that they are going to deliver anything worth talking about anytime soon. Especially with the comment recently that they are now focused on the User experience. Isn’t that what Jobs said back in 2007 with Apple? Why haven’t they been focused on the user experience before now? The fact that no-one is developing apps for their device despite their huge penetration should have screamed something at them before now? As has been well covered the 2 main players are Apple and Android devices. However the whole Microsoft, Nokia, Skype, Facebook tie now makes it possible that the next device delivered combing those 4 power houses could offer a lot to the consumer market. However while I feel right now like many others that RIM may end up another tech giant confined to the history books I do hope they get back on track and don’t live behind the illusion that just because they have a lot of money that all is well. I want them back offering choice in this most fantastic marketplace. I want to want a Blackberry again. However on to the nub of the issue and what all the above drivel was leading to is that I get asked very regularly what phone to go with and I will NOT be advising people to get a Blackberry (and haven’t done so for quite a few months now). I’ll be saying iPhone or Android (and keeping an eye on the Windows phone) for the foreseeable future. Well, since its first inception, RIM rarely changes Blackberry models or interface, so it’s unlikely that they’re going to do that tomorrow. Agree and I dont expect them to constantly change but tech has moved on. They need to innovate and bring new ideas to the table that will not necessarily fundamentally change their device but at the very least enhance it. They are not doing that. They are playing catch-up and playing it poorly. 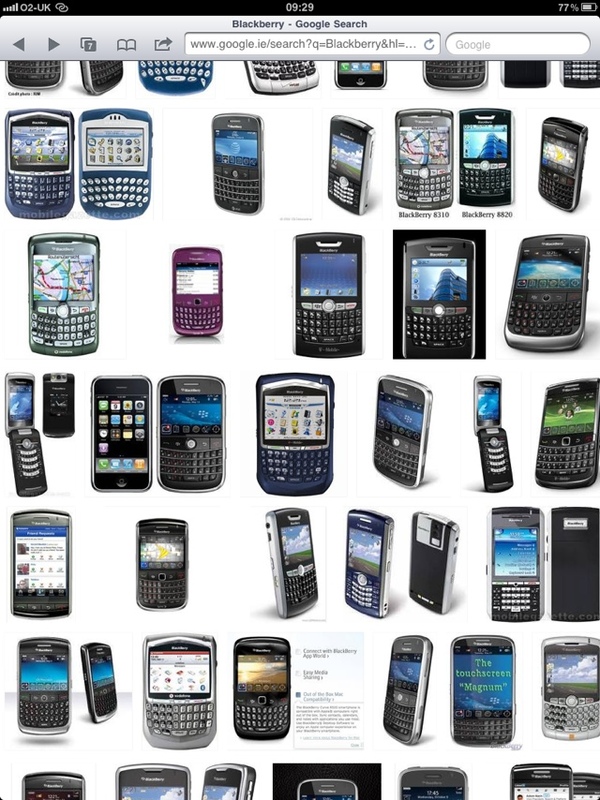 People spend 5 minutes on an iOS or Android device and they realise everything that their Blackberry is missing. Bringing out their Playbook without email was a monumentally poor decision and speaks volumes to managements view of the world – limited. How much really would it have cost to put a few extra developers purely on email integration for the device especially considering they have so much cash in the bank? It should have been next on the check-off list after a power on button……. its a pity as I have been a big supporter in the past…. and competition in the market is always good.